HARNETT COUNTY, NC (WTVD) -- A truck driver is exclusively speaking with ABC11 after she came face to face with two guns during a terrifying crash and chase in Harnett County. Lisa Dancy Hammer was driving along I-95 when she said things turned bad quickly. "This guy, from out of nowhere, comes and passes me on the shoulder and runs another pickup truck off the road," she said. Hammer pulled over to see whether someone needed help not long after, and her life was threatened. "I'm just getting out of my truck thinking, OK, is everybody alright?" she said. "But when I look back there's a guy with two guns, one in each hand coming towards me so all I can think to do is get away." She was able to get away unscathed. Authorities said Raymond Lee Bryant fired a shotgun at not one, but two tractor trailers. He was allegedly trying to hijack them. 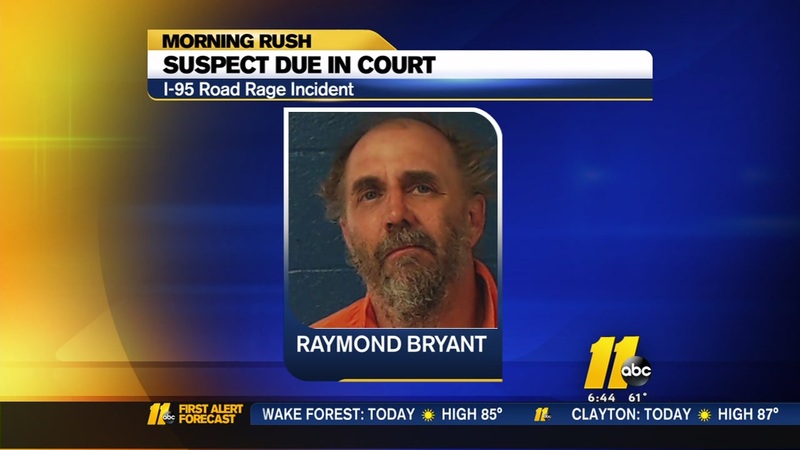 The Harnett County Sheriff's Office has identified the man responsible for the 'road rage' crash on I-95 Thursday afternoon, which led to an attempted carjacking and 50-mile police chase before the truck he stole ran out of gas. Officials said he was able to steal a pickup and lead law enforcement on a chase. Bryant was arrested and went before a judge Friday. He is facing several charges and the federal government is filing their own. "He needs to spend a lot of time in jail now because that was completely crazy. I could not believe someone would lose it that badly and it really took me by surprise," Hammer said.